The 1.618 series is the exactly reproduction of “golden rectangle” geometrical shape, its proportion is based on the golden ratio which defines a link between the major and the minor side which is the same between the minor side and the segment obtained by the subtraction of that one to the major side. The drawing of the golden ratio is not concealed, but rather enhanced by the manufacturing of the tile itself realised by imprinting the proportion drawing on it using a slight incision as a bassorilievo technique. All the possible compositions are equally excellent, from the most regular and symmetrical to the free ones made without rules, because generated by elements matched to each other. 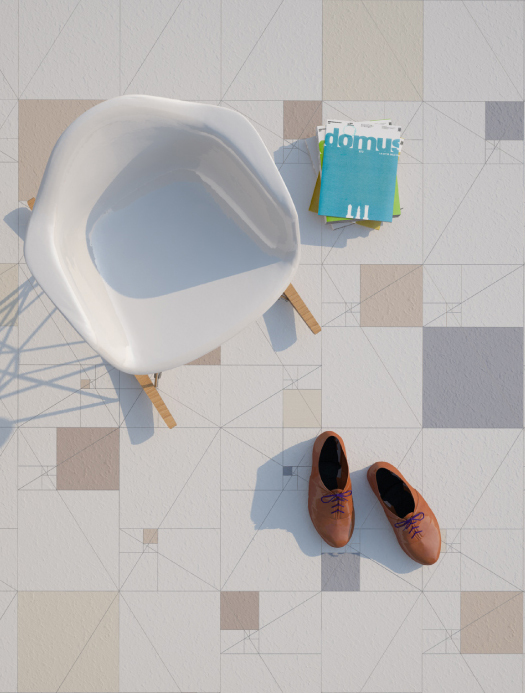 The tile, made by unglazed homogeneous porcelain stoneware, for its material and the natural palette of colours chosen, wants to refer to the untreated look of traditional floors made by cotto tile or concrete. The geometry of the “golden rectangle” determines the repetition of square shape which is recurrent in the distribution in different sizes, but always proportional to the biggest of them. It’s possible to obtain a rich abacus of different compositions thanks to two simple operations: turning the tile and colouring one single square shape for each tile choosing between one of the four colours in the proposed palette.